Most Christians would say that baptism is the one sacrament Christians of all denominations share, that it is the source of ecumenical unity among all Christian churches. But how true is that? Is there really "one baptism," as we profess in the Nicene Creed? If we disagree about what baptism does, can we really say that baptism unites us? To address this central question Susan Wood brings together the history and theology of baptism (systematic, sacramental, and liturgical), focusing especially on the divergent paths taken in the understanding of the sacrament since the Reformation. Founded not only in her study of theology but also in her years of participation in ecumenical dialogues, her perspective will illuminate this problem for readers and point the way toward deeper understanding. Susan K. Wood, SCL, is chair of the department of theology at Marquette University. Active in ecumenical work, she serves on the U.S. Lutheran-Roman Catholic Dialogue, the U.S. Roman Catholic-Orthodox Theological Consultation, the conversation between the Roman Catholic Church and the Baptist World Alliance, and the International Lutheran-Roman Catholic Dialogue. She is an associate editor of Pro Ecclesia and serves on the editorial advisory board of the journal Ecclesiology. She is the author of Sacramental Orders (2000), and editor of Ordering the Baptismal Priesthood: Theologies of Lay and Ordained Ministry (2003) both published by Liturgical Press. No future ecumenical conversation can afford to neglect Susan Wood's important contribution. She has certainly done what she hoped to do. She has produced a significant contribution on the path to Christian unity.
. . . an excellent source for an overview of where all of the major traditions align themselves on baptism. A fine treatment of baptism, of interest to theologians systematic, ecumenical, and liturgical alike. Susan K. Wood's ecumenical study of our 'one Baptism' merits wide attention from systematic, historical, and liturgical theologians. Baptism and Eschatology, Baptism and Justification, Baptism and Church are just some of the topics that this liturgically grounded and readable study treats with clarity and precision. A veteran of Roman Catholic-Lutheran dialogues, Susan Wood does here what many of us have been calling on theologians to do for some time, i.e., to root soteriology and ecclesiology in God's gracious gift of new life in water and the Holy Spirit in the font of grace where all new life begins so that a baptismal ecclesiology might be generated. I highly recommend this book for all professors and students of the initiation rites, and any parish personnel dealing with candidates for full communion in the church who would like to have a better grasp of the beliefs of those seeking full communion. 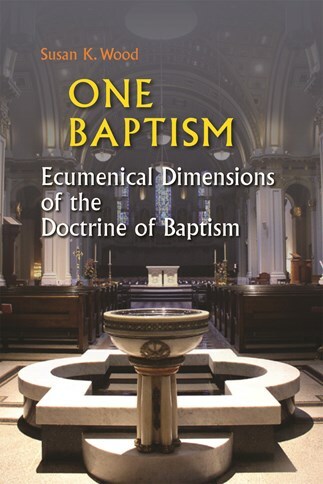 One Baptism: Ecumenical Dimensions of the Doctrine of Baptism represents a mature study of the historical, ecclesiological, sacramental, and doctrinal dimensions of Baptism as they have been stated over the Centuries by the Churches. Sr. Susan Wood has helped us along the path to full visible unity by offering a rigorous and careful study of the important questions concerning the meaning of Baptism as the foundation of the unity of the Church. An exciting new generation of books on baptism is emerging, and Susan Wood's ranks right up among the best of them. Engaging her knowledge of ecclesiology, history, and contemporary ecumenical dialogue Wood has achieved in the order of sacramental theology what reflective pastoral practice of the rites of baptism should likewise entail: an unfolding of insights into the event of grace as salvation for people and strengthening of the church. I am happily adopting One Baptism for my course in Christian initiation. The author has listened carefully to various points of view about baptism, and has presented these in a way that permits not just comparison but the emergence of new insights. She has gone far in answering her own question, `What does baptism do?' Baptism offers a foretaste of eschatological glory. Wood shows that Christians can walk the sometimes tortuous path to that goal with mutual respect and tangible hope. One Baptism delivers a vast, rich spectrum of meaning that is brought to baptism by the many Christian churches and communions. . . . [This] is a fascinating, comprehensive study that will eventually bring us closer to the unity we profess in sharing `one baptism'. The book also contains four helpful indices: subjects, documents, proper names, and Scripture citations.